A signature fave returns to debut a new nightlife option! The Studio54 concept has rocked dance floors throughout Western Canada since its debut in 2007 and it returns with special guest Brent Phillips, who last played with BSS at the inaugural Thriller Halloween party. 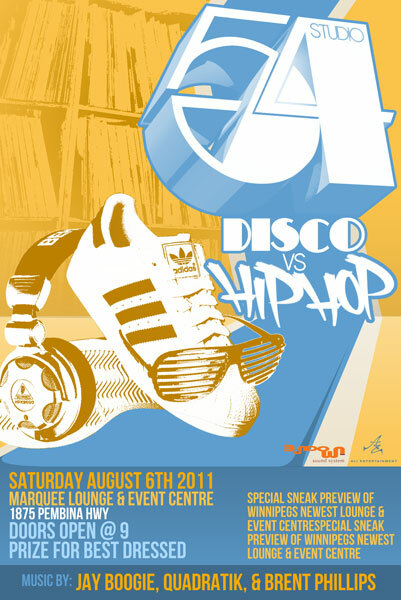 For this go-round, we’ve remixed Studio54 into a Disco vs Hip Hop theme, with Q and Boogz holding down the soundtrack of Hip Hop culture and Brent carrying the flag for classic and contemporary disco. Equally exciting is the debut of Marquee Lounge & Event Centre and the first ever monster collab with Ali Entertainment! The latest addition to Winnipeg’s nightlife scene takes over the space formerly held by Dylan O’ Connor’s, 1875 Pembina Hwy and is one of south Winnipeg’s most popular venues.